It has been 40 years since LEE Man-hee (1931-1975) passed away. 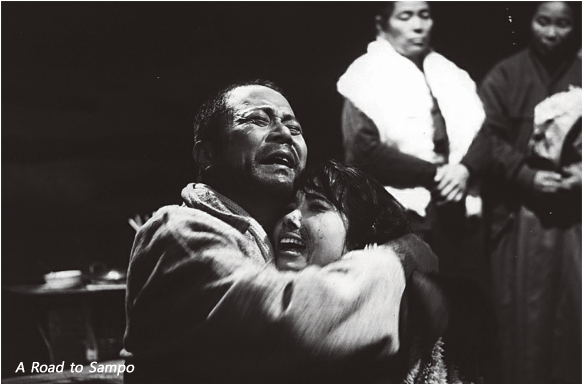 LEE collapsed and died when he was still editing A Road to Sampo (1975). He was only 44 years old, a still very active age. The cause of his death is officially known to be alcoholism, but the later generations know that it was the unfortunate atmosphere of that time that killed him. The harsh censorship, lack of production system, and commercial pressure all tortured LEE, a brilliant man with passion. LEE made up his mind to be a filmmaker after seeing CHOI In-kyu's Hurrah For Freedom (1946). LEE was a soldier during the Korean War and started his film career right after the war ended. His directorial debut was Kaleidoscope (1961). One year after he proved his talent with a sophisticated thriller Call 112 (1962) and made a big box office hit with a war movie The Marine Never Returned (1963). LEE was warmly received with The Devil’s Stairway (1964) and Black Hair (1964) as well. However, at the same time, he also suffered from harsh censorship. In December 1964, The Seven Female POW’s was censored and questioned for its pro-communist attitude to celebrate the North Korean soldiers. He was put in prison for 40 days until released for probation. Towards the later half of the 1960s, LEE made his masterpieces, namely, Full Autumn (1966), Way To Home (1967), and A Day Off (1968). Situated somewhere between realism and modernism, these are his true masterpieces. LEE turned the dark, damp and conned atmosphere which came from the Korean society and mentality of that time into a remarkably sophisticated and beautiful color. For example, let us take A Day Off, produced in 1968 but not even released due to harsh censorship and rediscovered like a miracle in 2005. The film intensely depicts a tragic day of a man in despair, straying around the city of Seoul on a lonely Sunday. IM Kwon-taek, a veritable symbol of Korean cinema, once said his rivals are KIM Ki-young and LEE Man-hee. In fact, a lot of people wonder what it would have been like if LEE had lived longer and made more films. That is why so many people are still waiting for Full Autumn to be discovered, the film that is said to be the most beautiful work of his but has been lost. Of course Full Autumn has not been discovered yet, but as time goes by, we are learning the new features of his works. Through the process of such discoveries, we have learned the true value of his film art world. LEE’s works are becoming more and more the heart of Korean cinema.